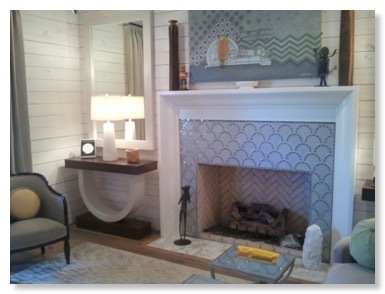 Founded in July 1987 Tile Heritage celebrates its 27th anniversary this year. Supporters like YOU... members, major contributors, industry sponsors, generous grantors... everyone... have made possible the continued fulfillment of the Foundation’s mission to Document and Preserve tile history in the U.S., both past and present. THANK YOU! Make a DONATION . . . . . . Comments about E-News? Share them for posting! Built in 1926 as a Georgian Revival style single-family dwelling, the building located on Lakewood Avenue South in the Mount Baker neighborhood overlooking Lake Washington was originally owned by F. M. Dener, who may well have been a tile contractor and/or dealer of exclusive handcrafted tiles during the 1920s in Seattle. 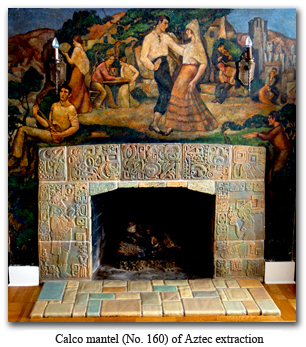 For reasons unknown Dener sold the house in January of 1929 to Abe and Rebecca Weinstein, who remained there for 30 years. The house itself contains a breath-taking treasure-trove of historically important ceramic tiles. 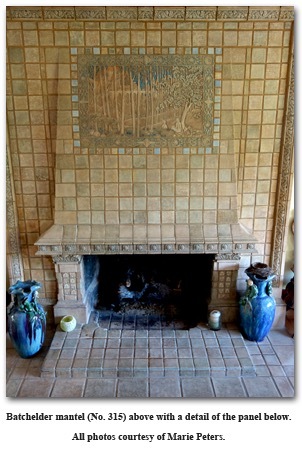 The main entrance to the house, for instance, is surrounded by Batchelder-Wilson (Los Angeles), a charming series of 8’ x 8” x 1 ½” high relief tiles (No. 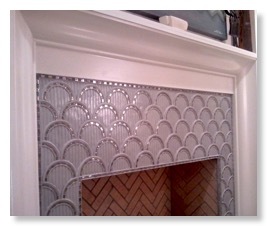 254 “Italian motif”) serving as a decorative border. 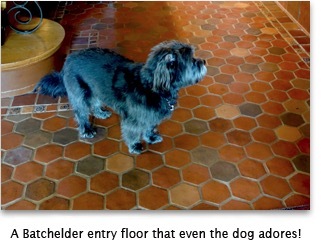 The floor of the entry hall is tiled in 4” hex pavers by Batchelder, rich and varied in a red range of colors bordered in part with Batchelder’s 2” x 2” Maya motifs. Turning left from the entry, on the far side of the living room, stands a magnificent floor to ceiling Batchelder mantel and hearth (No. 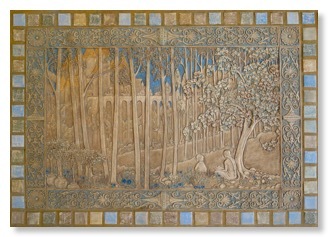 315) featuring a 2’ x 3’ tile panel depicting mother and child seated in a forest observing a long column of riders on horseback ascending and crossing a bridge on their way to a majestic castle in the background, a quintessential Arts & Crafts scene. 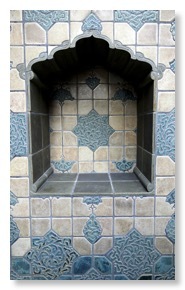 Directly behind this fireplace is the “Moroccan Room,” a tiled sunroom perched on the east side of the house featuring another tiled mantel, a tiled wainscoting, and a tiled floor with 3” x 3” decorative inserts all produced by Mensaque, Rodriguez in Seville (Triana), Spain (see below). The bright glaze colors and geometric designs along with the leaded glass windows create a lively living space for the family in residence. 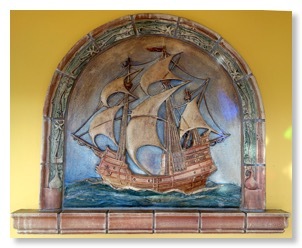 The highlight of the room is a 24” x 24” Spanish Galleon with an oval top (No. 462) produced at California Art Tile Company in Richmond, California (above). Downstairs in the library, directly below the Batchelder fireplace, is a spectacular Calco mantel (No. 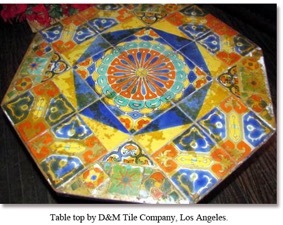 160) of Aztec extraction, adding “a touch of distinction” according to the tile maker in South Gate, California. “Our designs are from authentic sources and truthfully reflect the arts of a vanished race. This distinctive style with its virility of design and delicacy of technique… brings the art of a past American civilization to the esthetic enjoyment of the present.” The mantel measures just short of four feet across and nearly as high. 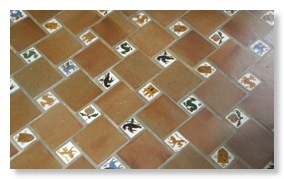 Claycraft tiles, also from Los Angeles, are found in several locations around the house. A fountain (No. 1401) on an outside wall measures 16” x 35” in height and features a satyr head for a spout along with a shell bowl below. Upstairs on a shower wall in one of the many bathrooms stands a stunning masterpiece, “Parrot and Flower Panel” (No. 1414), 20” x 40” tall, surrounded by Claycraft field and trim tiles, which without the decorative panel would be indistinguishable (the Claycraft installations are not pictured). 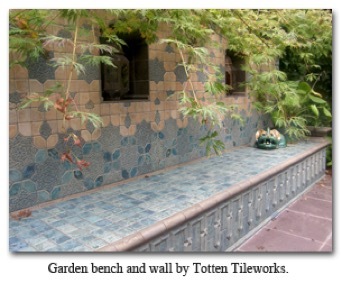 In 2001 to complement the quality and intensity of the historic tile installations in the house, the current owner, Marie Peters, chose Chuck Totten of Totten Tileworks in Winlock, Washington to design, fabricate and install a garden bench with niched wall. The Islamic design, filtered through the Arts and Crafts tradition and the artist’s Celtic genetics, measures over 17 feet long and nearly 6 feet high and took about 3 weeks to install. 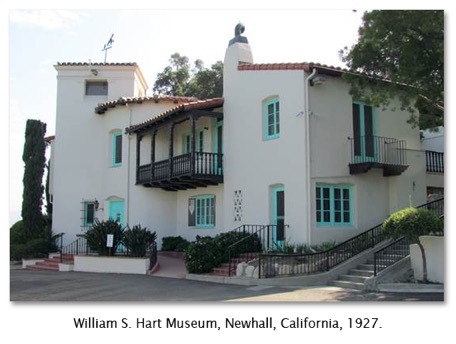 While visiting family in Los Angeles, I took a tour of the William S. Hart Museum Mr. Hart was a movie star during the silent film era and became famous for playing a cowboy in many westerns. In 1927 he commissioned Arthur Kelly to design his “dream house” in Newhall, north of Los Angeles. Hart had grown to love that town as many of his movies were shot on location in the area. When he retired from his acting career, he moved into his Spanish Colonial Revival mansion and spent the last 20 years of his life writing books and getting involved in his community. When he died in 1946, he left his home, property, furnishings, movie memorabilia and art collection to the County of Los Angeles. This was his way of giving something back to the public, those who had given him so much. I’m always interested to see the tile in old homes from the 1920s. These tiles are still in surprisingly good shape. The kitchen, pantry and guest bathrooms all have the same white tile. The wall tiles are 3” x 6”, with small hexagon mosaic tiles for floors and countertops. Even the trim is white, to emphasize cleanliness in these utilitarian areas. There are also glimpses of colorful 4” x 4” wall and floor tiles in the master bathroom upstairs. Back then, a lot of tile companies made the same shapes and sizes as these. I wanted to find out what company made the tile, but without any decorative tiles it might be difficult to identify the manufacturer. The one thing this house does have is distinctive soap dishes, toilet paper holders, towel bars, and toothbrush holders. Their shapes and designs were the same throughout the house, whether they had white or colored glazes on them. I was hoping they might be the key to identifying the manufacturer. As if that wasn’t enough of a challenge, there was also a small tabletop made of many different tile designs on a wrought iron base. It didn’t take very long for the Tile Heritage Foundation to identify the tiles and their makers for the Museum. 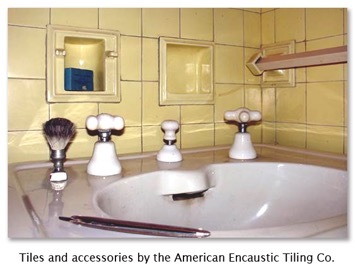 We were all glad to finally find out that the tile used throughout the house was made by the American Encaustic Tiling Company. In 1927 it had production facilities in Vernon and Hermosa Beach, as well as its original factory in Zanesville, Ohio. Founded in 1875, it had offices in New York City, and by 1930 was reputed to be the largest tile manufacturing company in the world. Derived from the Moorish architecture of Córdoba in southern Spain, Ellzey’s hand-crafted porcelain tiles are designed to coordinate with the objects that surround the fireplace in the home. The reflective elements in the tile are platinum, which are quite brilliant at night, illuminated from indirect light. Thumbing through the 224 pages of this new, soft-cover book, a treatise on one of Britain’s most reputable tile manufacturers, one is struck by the immense amount of research (obviously a labor of love) that resulted in the enormity of detail covering a company that was able to effectively adapt to the times over its 120-year history. 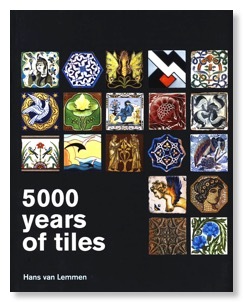 The book’s content is presented chronologically and interestingly illustrated with tiles representing various periods, significant installations, and highlighted by a selection of the company’s advertising. The text, which is thoroughly indexed, is complemented with ten appendices and an exhaustive bibliography. 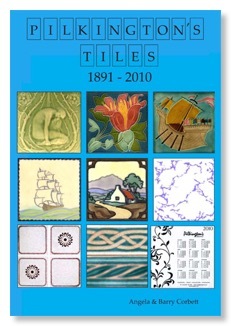 Pilkington’s Tiles 1891-2010 is available for purchase at Amazon UK. Or you may contact the authors, Angela & Barry Corbett, directly at http://www.pilkingtons-lancastrian.co.uk/firstpage.html. If you provide your name, email and mailing address, they will quote a price for the book plus shipping to the U.S. and you can pay with Paypal. Here is a 300-page soft cover book that rests comfortably in one’s lap and pays tribute to ceramic art tiles from around the world produced over the past 5000 years. 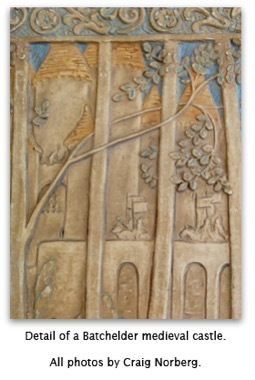 Written by the world’s eminent tile scholar, Hans van Lemmen, and lavishly illustrated on virtually every page, the text flows chronologically from the ancient civilizations in Egypt, the Middle East and China to Europe from medieval times through the Industrial Age, then culminating with art tile production in the United States. Art Nouveau and Art Deco along with other elements influencing tile design are treated to a chapter of their own as are a personal selection contemporary tile artists from Europe, the U.K. and the U.S. to welcome the 21st century. Make a DONATION today . . . there are many ways to assist!